How can we introduce younger lay people to the practical and accessible Wesley? In The Wesley Challenge small groups or whole churches will spend three weeks working through 21 questions that will engage their physical, spiritual and emotional lives and their relationship with God and others. With fast-paced emphasis on graphics and short content bits, the challenge will inspire us to a new kind of commitment-one that is more authentic, vulnerable and soul shaping resulting in thousands of people who have a renewed passion to discover deeper levels of commitment to God and others. 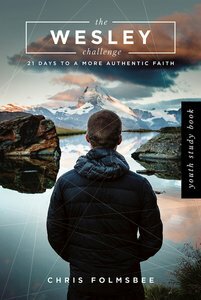 This Youth Study Book takes the ideas presented in the 21 Day Challenge and interprets them for young people grades 6-12. Can be used with the adult-level DVD. About "The Wesley Challenge Youth Study Book"